UP Pharmacy College Recruitment 2019 Apply Online for Latest Jobs in Uttar Pradesh as private candidates in Barabanki Pharmacy College. City College of Pharmacy is located in Barabanki promoted by Rajendar Prasad Educational Institute. 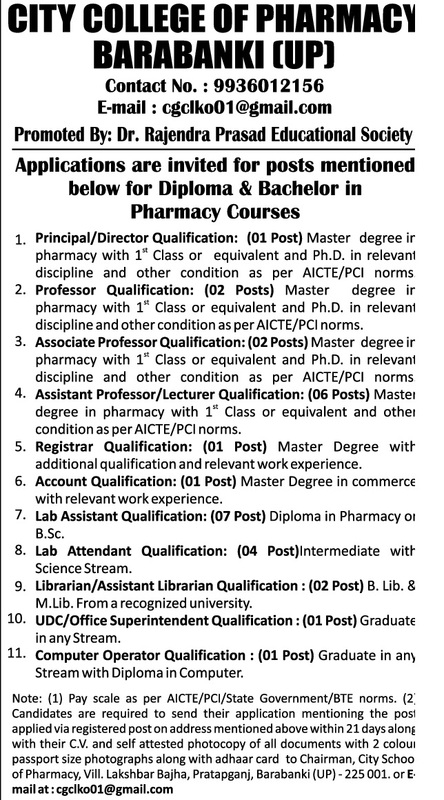 Application is invited to fill Paramedical Posts mentioned below for Bachelor Pharmacy Courses. 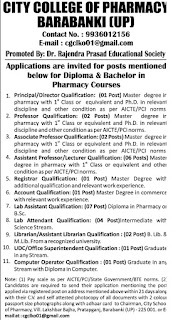 Pharmacy College Jobs 2019: There are 28 vacancy published on 1 April which is not April fool day. But you will late in these jobs than it will make you fool. Some Contact number 9936012156 and email address cgclko01@gmail.com is official given. You only have to do task of calling and sending resume to address. Name of the Posts: Teaching and Non Teaching. Total Number of Vacancies: 28 posts. 1. Principal/Director Qualification Master Degree in Pharmacy with 1st Class or Equivalent and PHD in Relevant discipline and other condition as per aicte/pci norms. 2. Professor Qualification Master Degree in Pharmacy with 1st class or equivalent and PhD in relevant discipline and other condition as per AICTE/pci Norms. 3. Associate Professor Qualification: Same as above professor eligibility criteria. 4. Assistant Professor/Lecturer Qualification: Master Degree in Pharmacy with 1st class or equivalent with experience and working in any college. Number of vacancies: 6 posts. 5. Registrar Qualification: Master Degree in Pharmacy with additional qualification and experience. Number of vacancies: 1 posts. 6. Account Qualification: Master Degree in commerce with relevant experience. 7. Lab Assistant Qualification diploma in pharmacy and experience. Number of vacancies: 7 posts. 8. Lab Attendant Qualification Intermediate with Science Stream. Number of vacancies: 4 posts. 9. Librarian/Assistant Librarian Qualification B Library and M Librarian from a recognized University. Number of vacancies: 2 posts. 10. UDC Office Superintendent Qualification Graduate in any stream. 11. Computer Operator Qualification Graduate in any stream with diploma in computer. Salary of Pharmacy College Staff Latest News: Who are on Samvida basis their Pay scale as per aicte norms, pci, state government norms. How to apply: Interested and Eligible candidates are required to send their application mentioning the posts applied for and send via registered posts on address mention below and above. Last Date to send your application within 21 Days of Notification. Document required: Along with CV, and attested photocopies of all document with 2 colors. Passport size photographs along with adhaar card to chairman. Latest Jobs in UP Private College address: Chairman, City School of Pharmacy, Village, Lakhshbar Bajha, Pratapgarh, and Barabanki (UP)-225001 OR EMAIL at cgclko1@gmail.com.